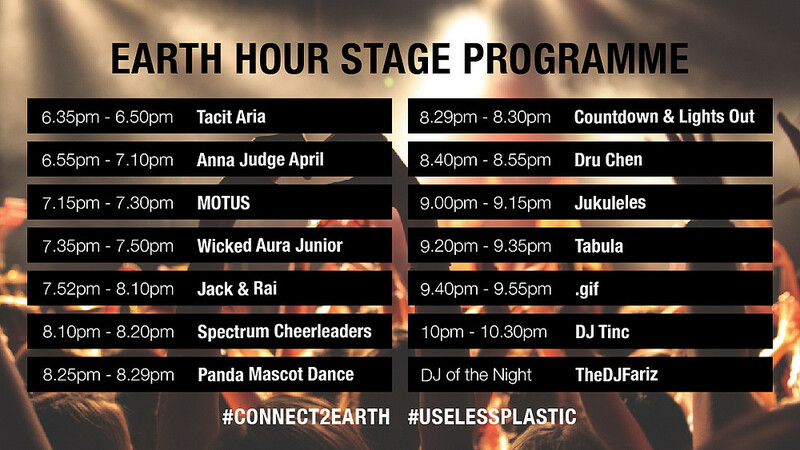 WWF’s Earth Hour, the world’s largest grassroots movement for the environment, is back in Singapore – and bigger than ever with a festival of family fun and entertainment. From 16 to 25 March, experience nature through Great Panda Quest by spotting WWF’s Pandas in the city, and get inspired by brands leading Singapore's green movement at the Earth Hour Marketplace. On 24 March, join some of the biggest local acts for the 60+ Countdown Bash and watch the Singapore skyline dim before your eyes. As lights go out across the globe for Earth Hour, plug in to a global conversation about the planet and make your voice count with #Connect2Earth. For the latest updates and event details, please visit our Facebook event page pand.as/EarthHour. 1. Public MRT Service - Nearest MRT Station is Esplanade. You may also head to the event via BayFront station at MBS. The buses available are 36, 56, 70M, 75, 77, 97, 97e, 106, 111, 133, 162M, 171, 195, 531, 533, 542, 700A, 857, 960, 961, 1N, 2N, 3N, 4N, 5N, 6N, NR1, NR2, NR5, NR6, NR7, NR8. 3. Grabshare/Uberpool - Alight at Esplanade Mall and walk around 80m towards The Float, or Mandarin Oriental and cross the traffic light. 4. Carparks at Mandarin Oriental and Marina Square. Launched in 2000, StarHub is Singapore's first fully-integrated info-communications company. As the pioneer in 'hubbing', StarHub offers a full range of unique and integrated information, communications and entertainment services for both consumer and corporate markets. StarHub, listed on the main board of the Singapore Exchange since October 2004, is a component stock of the Straits Times Index, MSCI Singapore Free Index and SGX Sustainability Leaders Index. StarHub has been a staunch supporter of Earth Hour since 2013. CHARLES & KEITH is the go-to fashion destination for stylish urbanites, recognized for its desirable fashion and curated collections of contemporary designs. With women as the central focus, the brand has developed a full-fledged line of footwear, bags, eyewear, accessories and costume jewellery. CHARLES & KEITH extends beyond brick-and-mortar with online shopping site www.charleskeith.com/sg. making the brand available through Asia Pacific, United States of America and Europe. The brand believes in being socially responsible by being an advocate for various Humanitarian Causes as well as Human Excellence and Environmental Initiatives. In support of World Wide Fund for Nature Singapore’s Earth Hour movement, CHARLES & KEITH presents ‘Where The Wild Things Are’, a nature-inspired capsule collection that celebrates this global movement, to be launched on 5 March 2018. Via masterful visual compositions, the complex relationship that we share with our environment is reflected in the editorial. It alsoemphasises the need to protect and preserve Earth’s precious biodiversity and natural resources. To support this important mission, CHARLES & KEITH will be switching off non-essential lights at selected stores on 24 March 2018 at 8.30 pm. As part of its corporate sustainability activities, the brand has also been using FSC-certified paper carriers instead of plastic bags. NTUC Fairprice Co-operative Ltd was founded by the labour movement in 1973, with a social mission to moderate the cost of living in Singapore. From one supermarket, it has grown to become Singapore’s largest retailer serving over half a million shoppers daily, with a network of over 140 outlets, comprising FairPrice supermarkets, FairPrice Shop, FairPrice Finest and FairPrice Xtra. Its convenience arm comprises a network of over 160 FairPrice Xpress and Cheers convenience stores, which serves over 100,000 customers daily. FairPrice Online offers a hassle-free online shopping experience. NTUC FairPrice also owns a Fresh Food Distribution Centre and a centralised warehousing and distribution company. Over 290 FairPrice and FairPrice Finest supermarkets, FairPrice Xtra hypermarkets, FairPrice Xpress and Cheers convenience stores will support Earth Hour 2018 by switching off non-essential lights; this is the tenth year FairPrice is supporting the global initiative, Earth Hour.